If you're throwing a special event and nothing but pure and classic sophistication will fit the bill, our line of diamond beaded curtains is sure to delight you. We make them with high-quality acrylic material, which does make a difference in the final product. Our exacting standards for materials ensure that the overall effect when you use our products is one that exudes class and quality; we would never sell something that would cheapen your special event. Our crystal curtains come standard as three feet by six feet, but we are more than happy to make you any customized size that will help you achieve the effect that you're envisioning. And with twenty different bead types, helping you execute your exacting vision is definitely a possibility. Particular about iridescent versus non? We have you covered with a line of non-iridescent curtains in the Brilliant line. The Brilliant line is clear with a nice gloss on the surface, while our other lines are iridescent and come in a variety of colors. Our diamond-beaded curtains easily fill up a lot of space and are incredibly versatile — all you need is a little imagination. They can easily form columns or you can create your own chandelier out of them. (Side note: we do sell columns and chandeliers as well, but we don't want to keep the do-it-yourself crowd from having the fun they're entitled to). Would you like your guests to see different colors? All you need to do is shine a different light on them! A colored LED light, that is. And then your gorgeous crystal curtains will easily reflect whatever hue it is you're reflecting off of them. 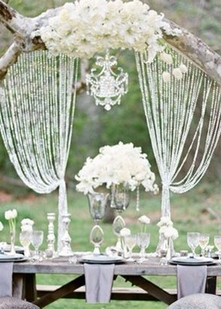 Our crystal curtains come pre-installed on a hanging rod and are ready to go with just a couple of nails and a hammer. But remember — don't untie them until after they are hung. Just a little tip from us to you to save you a lot of frustration. Chandelier "Lady Jane" K9 Crystal & Antique Silver 12" x 20" - 5 Lights! Chandelier "Falling Stars" - Clear Non-Iridescent Beads - 21.5" x 15"